I love to bake but sometimes, recipes can get overly complex or time consuming. While I don’t mind spending a long time on a kitchen masterpiece, not everyone feels that way. 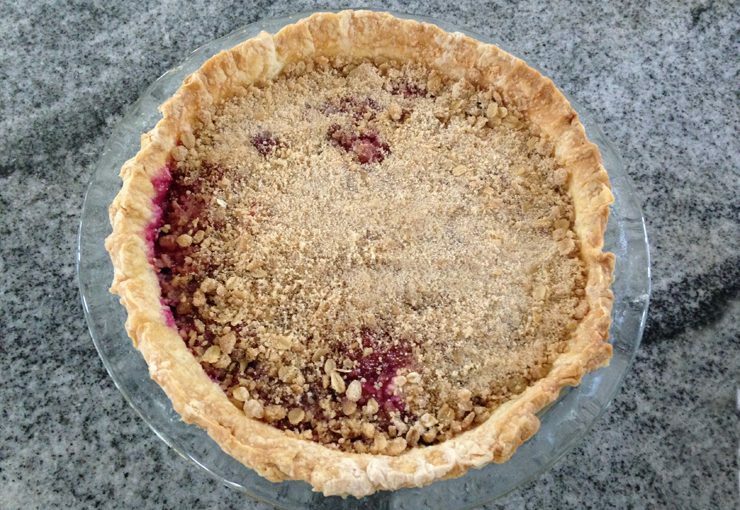 Luckily, this mixed berry streusel pie comes together very quickly thanks to frozen berries and is incredibly delicious. You can speed up this recipe even further by using a premade frozen pie crust, but the recipe below is for a homemade crust (because I believe that homemade is always better). This was a hit with everyone who tried it! I even subbed the butter for a dairy-free and soy-free alternative so my sister could enjoy it so this is a great pie to make if you are unable to eat dairy or soy. You can certainly adjust the fruit filling and use any number of things from just one type of berry like blueberry or blackberry or get away from berries altogether and make it with frozen peaches. Hope you enjoy this easy to make berry pie! In a liquid measuring cup, fill with 1 cup of cold water, add a few ice cubes and set aside. In a large bowl, whisk the flour, sugar, and salt. Using a pastry blender, work in the cold butter cubes until the mixture resembles tiny peas. Drizzle ½ cup of the cold water over the mixture and gather the dough with a spatula. Add additional water, 1 tablespoon at a time, until you’re making large clumps with the spatula (I needed an additional 3 tablespoons and you may need more or less). Begin kneading the dough together with your hands until you have a smooth mound. Shape the dough into a flat disk and chill in the fridge for at least 1 hour (preferably 2). Roll out the chilled dough into a large circle and place inside a pie plate, crimping the edges decoratively if you’d like then set aside. In a large bowl, stir together the frozen berries, vanilla, sugar and flour until everything is well coated. Pour into the pie plate and spread around evenly. In another bowl, mix all the streusel ingredients together using your hands until the consistency resembles wet sand. Top the pie with the streusel and bake for 1 hour, or until the topping is golden brown. Chill completely before serving – either on its own or with whipped cream or ice cream.